Hinterachse links und rechts. 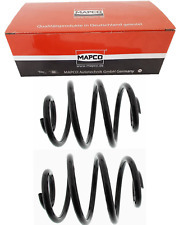 2x Mapco Fahrwerksfeder. Einbauseite Hinterachse. Chevrolet Kalos. Daewoo Espero (KLEJ). 9 CHEVROLET KALOS 1.2. 10 CHEVROLET KALOS 1.4. 11 CHEVROLET KALOS 1.4 16V. Coil Spring. Position: Rear. Other Information: Single. Our Part No's / OE PART NUMBER VAPK51602-A. COIL SPRING. Position FRONT. Our Part No's / OE PART NUMBER VAP47013AC. 2 Muelles Eje Delantero Daewoo Lanos 1, 6 Año Fab. 05.1997-12.2002 Nuevo Gh. Daewoo Lanos (KLAT) - [05.1997-12.2002]. Einbauposition Links. Einbauposition Rechts. Einbauposition Vorne. EAN 4251530801858. Coil Spring. 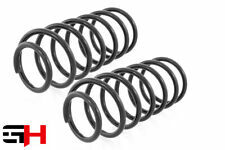 Other Information: Single Coil Spring. Fitting Position: Rear Axle. Part Number : 47012. The spring rate is made up of the variables: ‘Change in the force impacting on the coils’ for ‘Resulting change in the length’ of the spring. A spring with a constant ‘stability’ is described as a spring with a ‘linear characteristic curve’. 2 Muelles Eje Delantero para Daewoo Lanos 1, 4/1, 5 Año Fab. Daewoo Lanos (KLAT) - [05.1997-12.2002]. Produktgruppe Federung. Einbauposition Links. Einbauposition Rechts. Einbauposition Vorne. EAN 4251530801841. 2 Muelles Eje Delantero Daewoo Matiz i,II ( Klya ) Año Fab. 1998-2005 - Nuevo Gh. Daewoo Matiz I, II (KLYA) - [04.1998-04.2005]. Einbauposition Links. Einbauposition Rechts. Einbauposition Vorne. EAN 4251530801803. 5.1997 - >. PRIMAVERA DAEWOO LANOS DE BJ. Daewoo Lanos. 8255 318 Daewoo LANOS (KLAT) 1.3 55 75 05/1997 al presente Construido por 12/2002. 8260 002 Daewoo LANOS (KLAT) 1.3 55 75 05/1997 al presente Construido por 12/2002. CHEVROLET / DAEWOO AVEO SALOON (T300) 03/2011-. 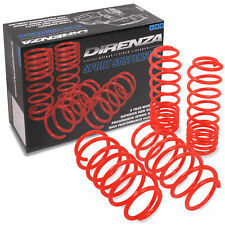 Sport springs enable safer and better cornering. The car is lower and stiffer, so more stable, which gives a much better driving experience. Also the car’s look and line is more aggressive and dynamic. Daewoo Espero (KLEJ) - [01.1992-09.1999]. Daewoo Lanos (KLAT) - [05.1997-12.2002]. Daewoo Nexia (KLETN) - [07.1995-08.1997]. Einbauposition Links. Einbauposition Rechts. Einbauposition Hinten. EAN 4251530803982. Part Number : 47039. The spring rate is made up of the variables: ‘Change in the force impacting on the coils’ for ‘Resulting change in the length’ of the spring. A spring with a constant ‘stability’ is described as a spring with a ‘linear characteristic curve’. 2x Fahrwerksfeder der Hinterachse links rechts. Koppelstangen & Pendelstützen. Spurstangen/ -köpfe. Querlenker/ Traggelenke/ Lager. Federn /Stossdämpfer. LANOS (KLAT). LANOS Stufenheck (KLAT). Daewoo Lanos 1.3. Feder Fahrwerksfeder Serienfeder Spiralfeder Schraubenfeder. - Keine Tieferlegungsfedern! Es sind Ersatzfedern für Original oder wenn angegeben, Sport ab Werk! 1 Stück Qualitäts Fahrwerksfeder. Hinterachs-Feder für. Feder Fahrwerksfeder Serienfeder Spiralfeder Schraubenfeder. - Keine Tieferlegungsfedern! Es sind Ersatzfedern für Original oder wenn angegeben, Sport ab Werk! Nicht für Fahrzeuge mit Allradantrieb. Part Number : 47045. The spring rate is made up of the variables: ‘Change in the force impacting on the coils’ for ‘Resulting change in the length’ of the spring. A spring with a constant ‘stability’ is described as a spring with a ‘linear characteristic curve’. Feder Fahrwerksfeder Serienfeder Spiralfeder Schraubenfeder. KLAU / U100. Tacuma / Rezzo. - Keine Tieferlegungsfedern! Es sind Ersatzfedern für Original oder wenn angegeben, Sport ab Werk! Nicht für Fahrzeuge mit Allradantrieb. Coil Spring. Position: Rear. Our Part No's / OE PART NUMBER VAPK51605-B. Other Information: Pair. Feder Fahrwerksfeder Serienfeder Spiralfeder Schraubenfeder. - Keine Tieferlegungsfedern! Es sind Ersatzfedern für Original oder wenn angegeben, Sport ab Werk! Lacetti Schrägheck. 1 Stück Qualitäts Fahrwerksfeder. Kit de suspensión, muelles helicoidales para CHEVROLET / DAEWOO NUBIRA 1.6, 1.8. DAEWOO 96407219. CHEVROLET 96407219. Almacenamiento de disco. Filtro de motor. Forma de resorte: Muelle helicoidal. Lado de montaje: Eje trasero. Part Number : 47010. The spring rate is made up of the variables: ‘Change in the force impacting on the coils’ for ‘Resulting change in the length’ of the spring. A spring with a constant ‘stability’ is described as a spring with a ‘linear characteristic curve’. Coil Spring. Position: Rear. Other Information: Single. Our Part No's / OE PART NUMBER VAPK51600-A. Espero / Aranos. Feder Fahrwerksfeder Serienfeder Spiralfeder Schraubenfeder. - Keine Tieferlegungsfedern! Es sind Ersatzfedern für Original oder wenn angegeben, Sport ab Werk! Drahtdicke und Länge unterscheiden sich von der normalen Feder! Coil Spring. Other Information: Pair. Position: Rear. Our Part No's / OE PART NUMBER VAPK51614-B. Ssangyong Musso 2.3 08/97-12/98. Ssangyong Musso 2.9 Turbo 01/98-12/98. Ssangyong Musso 2.9 05/95-12/98. Daewoo Musso 2.3 (1999-2002) 03/99-12/02. Daewoo Musso 2.9 (1999-2002) 03/99-12/02. Part Number : 47034. The spring rate is made up of the variables: ‘Change in the force impacting on the coils’ for ‘Resulting change in the length’ of the spring. A spring with a constant ‘stability’ is described as a spring with a ‘linear characteristic curve’.